Hi ya'll! I know I've been MIA for a while. I've been crazy busy these days. But I'm back on track and hope to post more outfits! Anjolee was nice enough to send me these lovely diamond earrings. I love diamond studs and they're a classic staple that adds taste and sparkle to any look. I just throw these babies on and feel pretty. They go well with any ensemble and they're simple, just my cup of tea. Definitely go and check out the Anjolee's diamond stud earrings, diamond bracelets, and wedding set. They customize their jewelry to cater to your style and it's fun to play around with on the site. By the way, if you're wondering...my hair isn't this long. I wore hair extension clip ons. haha. I've been missing long hair lately, especially being able to do the side bride. You look so good :) I love the cream color of the top with the orangey skirt. I might imitate this look... Nice to hear from you again! you look lovely! i wish i had a pair of diamond earrings...sigh one day :) and i feel for you on the whole missing long hair thing. my hair can't grow fast enough. i want it back! Diamonds really are a girls best friend. They will never let you down and they complete every look. I just happened to stumble across your blog, I dont even know how I got here lol. but Im glad I did coz I love your style! This outfit is so beautiful. Love it all! Love this look! Adore your lace top. Loving that gold watch! It is beautiful! And I adore the classic little diamond earrings... it's so simple but it's one of my favorite looks ever! Just found your blog and I've loved getting to know you better, I'm excited to follow along! Love your outfit! I have the same lace top-I got mine at DEBS. This outfit is amazing! The colours, the hair, the makeup! wow! 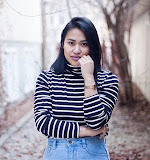 Love your blog and you have amazing style, girl! Now following! I can't wait to read more. What a lovely outfit! I love the combination of lace and the skirt, nice! You are absolutely gorgeous, woman! Thanks for stopping by my blog.. This outfit is perfect, and the colors work so well together. I'm in love with the top especially!